The « Coded Poems » are versified texts describing the Fighting Holds techniques in the « Codified Sequences » teached to martial students. Those techniques are presented under the form of Codes for preserving the Martial School. The respective description of « Coded Sequences » under the form of « Coded Poems » from Việt-Nam and from the China is completely different although it uses the same way inherent to versified texts which the most are writen in poems with coded lines of seven words . This difference in the description of "Codified Sequences" comes from the fact of the conceptual antagonism between the Vietnamese Martial Arts and the Chinese Martial Arts. The techniques of Fighting Holds in Vietnamese Martial Arts are linked between them, while those of Chinese Martial Arts are separate. In the « Coded Poems » of Chinese Martial Arts, each Coded Line with seven words are writen indeed for stating an unique Fighting Technique : 4 first characters are used for fixing the name of the Fighting Technique and 3 last characters for defining its application or for describing or stressing an essential point of this Fighting Technique. An obvious proof, taken as exemple, is that in the « Coded Poem » of the Codified Sequence of « The Wielding of Plum Flower Spear » (Mai-Hoa Thương-Pháp), writen according to the mode of poem with coded lines of verse with seven words, including 47 coded lines by 7x47=329 characters, 4 first characters are used for fixing the name of the Fighting Technique and 3 last characters for defining its application. We can quote as typical examples like in Fighting Hold « To Move Forward for Covering the Summit, Thrusting Spear into the Upper Part of the Stomach » ( 上 部 蓋 鼎 Thượng-Bộ Cái Đỉnh, 刺 腹 上 Thích Phúc Thượng", or these « White Monkey Moving his Body, Sweeping the Eyebrows with the Spear » ( 白 猴 轉 身 Bạch-Hầu Chuyển Thân, 掃 眉 槍 Tảo Mi Thương), etc. When Chinese Masters disclosed them to the others, they only passed on the 4 first Words and did not teached the 3 last. Consequently, with the time, Coded Poems in Chinese Martial Arts passed on in Việt-Nam, for exemple, only own 4 first characters in each Coded Line. This fact leaded of later a certain number of persons to commit the errors by believing that each Coded Line in Chinese Martal Arts Codified Sequences only owns Four Words and these of Vietnamese Martial Arts Sequences owns Seven Words. In the « Coded Poems » of Vietnamese Traditional Martial Arts, each Coded Line is written with seven words for determining a certain number of Fighting Holds chains of Parries and Ripostes : the words in each Coded Line take on all the definition of the application and the designation of a certain number of Fighting Holds linked between them and in which the description of each Fighting Hold is condensed so that to contain several Fighting Holds in only one Coded Line. In addition, Codified Sequences in Vietnamese Traditional Martial Arts Martiaux are still coded with tetrametrique lines of four words (i.e. : « Thiền-Sư » , « Chấp-Thủ Đỏan-Côn »), or pentametrique lines of verse with five words (i.e. : « Đồng-Nhì » , « Phượng-Hoàng » ), or stil hexametrique et octametrique rhymes lines of verse (i.e. : « Yến-Phi » , « Tấn-Hưng »), or with unequal lengths lines of verse (i.e. : « Thần-Đồng » , « Ngũ-Môn Phá Trận »). - The advantages of the codification in Chinese Codifieed Sequences lie in the exact detemination of each Fighting Hold as it can obscure the pratical applications, and this codification is precious as far as the accurate systematisation of diverse Fighting Holds is concerned. Their disadvantages lie in the fact that this chinese codification leads the necessity to martial students (above all the ones who only has learned the four first words of each Coded Line) to have the analytical explanation of techniques in each Code Line so that to be able to know the application then to reseach themselves the way to link together the various Fighting Holds during the combat. We quote as exemple the Fighting Hold «Kim-Kê Độc-Lập, Điểm Hạ-Phương» in the Codified Sequence «Mai-Hoa Thương» (Spear of Plum Flower). If the 3 last words «點 下 方 Điểm Hạ-Phương» was not passed on the martial student, the one must receive the analytical explanation of the Fighting Hold «金 雞 獨 立 Kim-Kê Độc-Lập» in the wielding of Spear according to the Codified Sequence «Spear of Plum Flower» for being able to know the application. - The advantages of codification in Vietnamese Codified Sequences lie in the rigorous notification of all movements in the Codified Sequences as it can skilfully obscure the pratical applications and this codication is precious as far as the effective description of Parries and Ripostes chain. Their disadvantages lie in the fact that this vietnamese codification easily leads the lost of the Codified Sequences original because if the Coded Poems was written with spelling mistakes, their understanding and their execution would be inexorably erroneous. We quote, as typical exemple, the Fist Art Codified Sequence «The Cup of Jade - Ngọc-Trản ( 玉 琖 拳 )» (whose the true name is «Mộc-Thiều Quyền-pháp 沐 髫 拳 法»), in which is found the line «Luyện Diệp Liên Hoa Đả Sát Túc», that in ours days a certain person has copied out by mistake «Uyển Diệp Liên Hoa Đả Sát Túc» and the others have even erased the two first words «Luyện Diệp». It is really about the infinitely regrettable fact ! Those men has erroneously understood - because of the homonymy and the homophony due to the romanization of vietnamese writing by Alexandre de Rhodes (1591-1660) - the sinovietnamese character «Diệp» in the Coded Line by taking it for «Diệp 葉 meaning "Leaf"» because they do not know that the sinovietnamese character «Diệp 饁 means "To Serve the Dish"». And this is precisely also be cause of that, there are somebodies having deducing that, in the Coded Line «Luyện Diệp Liên Hoa Đả Sát Túc», the term "Diệp" faisait alluded to the technique of "Hands passing through the leaves" (Xuyên Diệp Thủ), who therefore did'nt know that the technique "Hands holding the Cup of Jade" in this Codified Sequence «Ngọc-Trản Quyền» is a characteristic point of each School System. Jesuit Father having latinized Vietnamese Language. 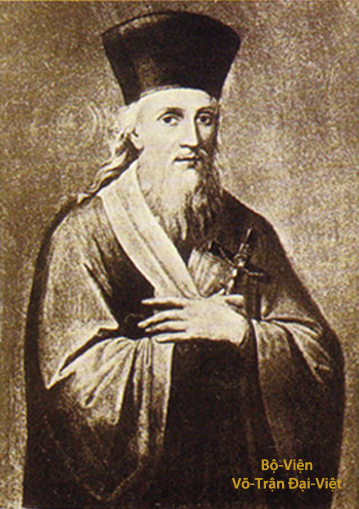 from Jesuit Father Alexandre de Rhodes (1591-1660). The Coded Poems of Codified Sequences bequeathed to us by Traditional Martial School Systems of Việt-Nam - as the case of those of Codified Sequences passed on us by Great Master Trương-Thanh-Đăng - include also several spelling mistakes caused by various reasons. It is regrettable that some individuals who - by wanting to correct arbitrarily Coded Poems from a certain number of Codified Sequences - have so added others spelling mistakes, then have irresponsibly posted it with French translation on various WEBsites. Given the originals of these Coded Poems transcribed in HAN chinese characters & NÔM demotic characters had been lost, only live on theirs phonetic translations. Sadly ! It exists, these last times, certain personnes who - in order to falsify the originals - have retranscribed in chinese characters these texts phonetically transcribed in latino alphabet, lots of orthographic mistakes, making absurd the Coded Lines sense (i.e. : the Spear's Coded Poem "Nghiêm-Thương" ). 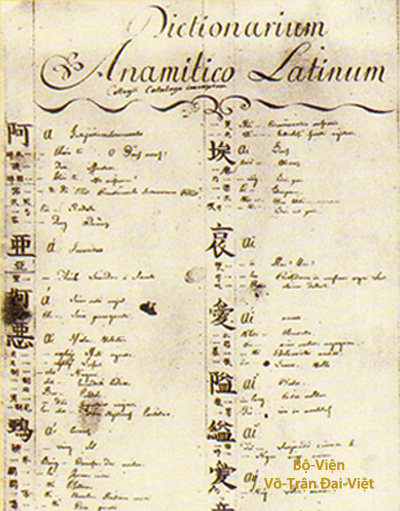 These Coded Poems transcribed in vietnamese according to the latino alphabet needed to be rectify on the orthogrphic plan before to be retranscribed in chinese characters, car these last one are very specific, and that gomes under a work requiring a logic precaution in the conservation and restoration of cultural heritage of Traditional Martial Arts Studies from Việt-Nam.